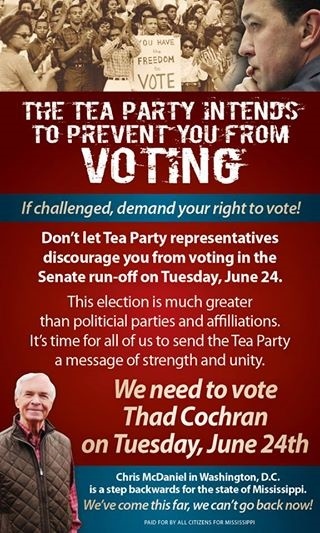 Thad Cochran successfully reached out to black voters in primary against a Tea Party challenger. Tea Party insurgent Chris McDaniel came tantalizingly close to knocking off Senator Thad Cochran in Mississippi’s Republican primary runoff last week, but a surge in black voter turnout saved the six-term incumbent’s bacon. Cochran’s election to a seventh term in November now seems a foregone conclusion, and boy, are a lot of conservatives mad. But whatever else the election outcome meant, Cochran’s “reaching across the aisle” made his victory a noteworthy instance of something that supposedly doesn’t and can’t happen in Mississippi even today: A white GOP politician sought support among Democrats, and particularly black Democrats. And far from being politically powerless, they tipped the election. Under Mississippi’s open-primary rules, anyone who hadn’t already voted in the Democratic primary could vote in the Republican runoff. The Cochran camp openly solicited crossover support, as John Hayward wrote in Human Events, “through a combination of race-baiting attacks on McDaniel, and touting his [Cochran’s] ability to make government larger and bring home more goodies from Washington.” National Review called it a “Two-Faced Victory”: In majority-black neighborhoods, Cochran’s ads and mailers played up his support for historically black colleges and food stamps. In predominantly white districts, other pamphlets highlighted his support for the National Rifle Association and his opposition to abortion and Obamacare. It was reprehensible. But really: Who over the age of 11 is surprised when incumbents resort to reprehensible tactics to beat back a challenger? Or when voting blocs and politicians who normally wouldn’t give each other a second glance across a crowded room choose to snuggle up as bedfellows when mutual interests emerge? The NAACP’s most recent civil rights “report card” gives Cochran an F, but that didn’t stop black voters from turning out in force. “With Cochran, we know what we’ve got, and we like what we’ve got,” the president of the NAACP’s Jackson branch announced. Somehow all the voter intimidation that the Tea Party was accused of plotting never materialized. On the eve of the election, The New York Times fretted that McDaniel’s campaign was bent on “Scaring Away Black Voters in Mississippi.” But black voters weren’t scared. There was no reason they should be. This isn’t June 1964, when volunteers James Chaney, Michael Schwerner, and Andrew Goodman were murdered by the Klan for trying to register black citizens to vote. It is June 2014, when at the faintest whiff of voting-rights discrimination a battalion of civil rights attorneys is ready to march into federal court. When the Supreme Court last year struck down Section 4 of the Voting Rights Act, critics warned frantically that minority voting rights were in mortal peril. Congressman John Lewis, a Georgia Democrat, said the court had “put a dagger in the heart” of what the civil rights movement had achieved. The ruling was “as lamentable as Plessy or Dred Scott,” wailed The Atlantic. From the hue and cry, you could have been forgiven for thinking that the court had pronounced Jim Crow-era literacy tests and poll taxes constitutional after all, and advised black voters to forget about ever flexing their electoral muscles again. Well, don’t tell that to McDaniel. 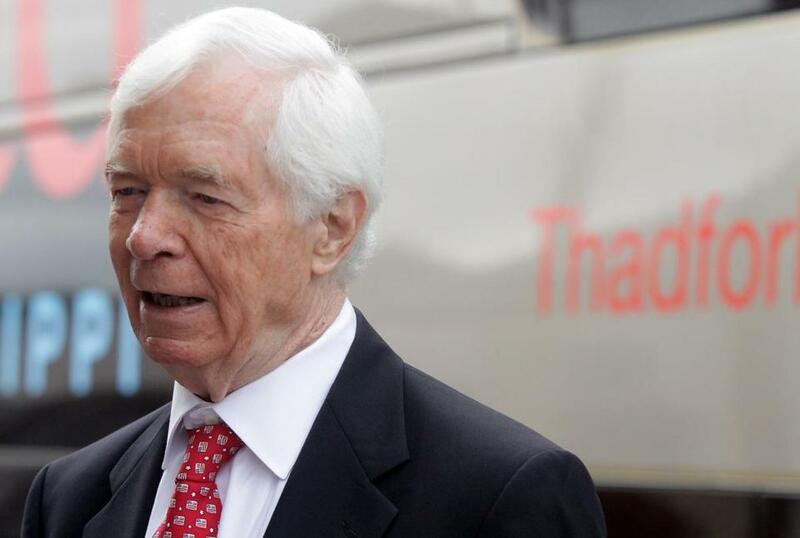 Cochran’s appeal to black voters may not have been honorable. It certainly wasn’t conservative. But it was indubitably effective: In the 24 Mississippi counties with black majorities, turnout soared by an average of 40 percent from the primary to the runoff. One of the most senior members of the state’s Republican establishment just won the fight of his career. What turned the tide was the exercise by black citizens of their right to vote — a right that is no longer endangered anywhere in America, not even in Mississippi.